After six years of Dutch and German dominance a new world order was on the European Cup horizon. Since the competition’s inception 20 years ago a solitary English club, Manchester United, had been crowned European champions. England’s finest though were steadily improving in Europe as Liverpool and Spurs had won the UEFA Cup three times in five years while the Cup Winners’ Cup had been won by Manchester City and Chelsea during the early 1970s. Leeds United came closest to repeating United’s European Cup heroics before they stumbled at the final hurdle against the legendary Bayern Munich side. Times were about to change as English football dominated the European Cup from 1977 to 1985. Bayern’s quest to join Real as the only two teams to win more than three European Cups looked tough from the outset as they were drawn in the bottom half of the draw, which contained countrymen Borussia Monchengladbach, plus Real Madrid, Italy’s Torino and Dynamo Kiev. Of the quartet it was the Ukrainians who deposed the European champions with two late goals in Kiev which trumped the Germans slender first-leg 1-0 advantage. In Bayern’s absence Monchengladbach continued to fly the German flag as they eliminated the Italian champions. Torino were chasing the tie after a first-leg 2-1 defeat and so they required a typically disciplined Italian performance which never materialised. Instead Il Toro lost all their composure by having three players sent off. 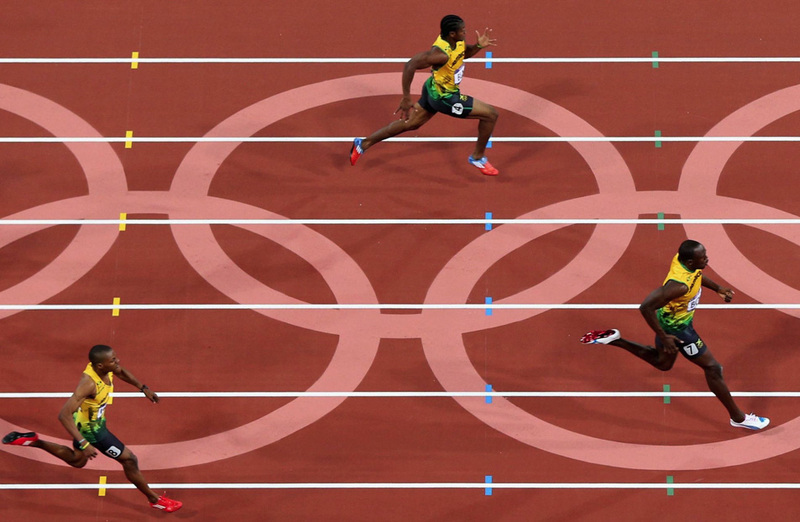 The only achievement was that Borussia still could not score despite the three-man advantage. The Germans then beat Club Brugge, who had themselves knocked out Real Madrid in the earlier round and in the semi-finals they faced Bayern’s conquerors Dynamo. A 1-0 defeat in Kiev was overcome through 2-0 home victory to ensure their qualification to the final. There they faced Bob Paisley’s Liverpool. The club had grown immensely under Bill Shankly’s direction as he led the Reds to promotion, back into England’s top-tier division, and then went on to win three English championships, two FA Cups and a UEFA Cup. When his surprise retirement was announced, his assistant Bob Paisley took over and led the club to even greater heights. Early on during the 1976/77 European Cup Liverpool had a tricky tie to negotiate against Turks Trabzonspor. After losing 1-0 in Trabzon, the Reds ruthlessly seized the initiative an Anfield as they scored three times in the opening 20 minutes to secure the tie. They played previous finalists’ Saint-Etienne where they suffered the same feat in the away game by losing 1-0. This time a narrower 3-1 win at Anfield was enough for progression. In a one-sided semi-final Liverpool cruised past FC Zurich 6-1 on aggregate scoring three goals in each tie but there was no time to rest as the Reds were chasing an unprecedented treble by winning the English league title, FA Cup and European Cup. The league had been secured but only four days before the European Cup final in Rome Liverpool lost the FA Cup final to bitter foes Manchester United. The contest in Rome was the Reds 17th game in six weeks so they needed to pace themselves. They dominated and deservedly scored first but against the run of play Dane Allan Simonsen equalised with a smart finish and could have scored another without the heroics of goalkeeper Ray Clemence. A Tommy Smith header and a Phil Neal penalty, after a penetrating run from Keegan ended in a foul, restored order as the Reds won 3-1 and England had its first European champions in nine years. The general feeling celebrated a glorious end of an era for Liverpool, rather than the beginning of something special, as Kevin Keegan would depart the club for mainland Europe and Smith, Ian Callaghan and Steve Heighway were coming to the end of their careers. The Reds star player Kevin Keegan transferred to German club Hamburg in the summer and was replaced with Celtic’s Kenny Dalglish. He was not only the only Scot to join Liverpool as the Reds also brought in Graeme Souness and Alan Hansen. Losing finalists from the previous season Borussia Monchengladbach had an instant chance at revenge as both clubs faced-off in the semi-finals. The Germans won 2-1 at home but their slight advantage lasted six minutes as Kennedy levelled the tie. Further goals from Dalglish and Jimmy Case booked Liverpool’s passage to a second successive European Cup final. On the other side of the draw Juventus had eliminated Ajax on penalties in the quarter-finals and were four minutes from another shoot-out against Belgians Club Brugge but René Vandereycken scored to ensure Juventus kept waiting for their first European Cup. The final was played at Wembley where a Dalglish goal was enough to secure Liverpool’s second European Cup. Brian Clough became notorious as Derby County’s manager by leading the unfashionable Midlands side to the English championship in the 1970s. He left the Baseball Ground for brief spells with Brighton & Hove Albion and Leeds United and then eventually joined second division Nottingham Forest. Clough, a former player who had a prolific goalscoring record, revived the club as they were promoted in two seasons and then won the league title at the first attempt. Clough is only the fourth manager to win the English title with two different clubs. Forest were given no favours on their first European Cup assignment as they drew holders Liverpool in the first round. Despite being league champions the Midlands side were underdogs but Garry Birtles and Colin Barrett scored at the City Ground to give Forest a 2-0 first-leg win. In the second-leg at Anfield, Liverpool’s creative threat was stifled and a 0-0 draw meant the holders who had swept all of Europe away in the preceding two years were eliminated, ironically by an English club. Real Madrid and Juventus were also in the same side of the draw but they became victims to Grasshopper and Glasgow Rangers respectively. Forest advanced to the final where they faced Swedes Malmo who in turn had beaten Dynamo Kiev, plus Polish and Austrian opposition to get to Munich. Forest were able to include Trevor Francis, their £1 million summer signing, for the first time due to UEFA restrictions based on his signing and it was Francis himself who headed the winner and to Nottingham’s delight a rags to riches story left them and Clough the toast of Europe. Georgia’s Dynamo Tbilisi provided a huge upset as they eliminated Liverpool courtesy of a 3-0 home win. In the next round they would face German champions Hamburg. Kevin Keegan’s move to the German side after Liverpool’s first European Cup triumph was a success, particularly from an individual perspective, as the Englishman won two consecutive Ballon d’Or awards—the first player to achieve this since Johan Cruyff. Tbilisi’s campaign ended as Keegan scored two of Hamburg’s six goals across both games to reach the next round. The Germans then beat Hajduk Split on away goals, before they encountered Real Madrid in the semi-final. Real took a commanding 2-0 lead from the Bernabeu with them to Germany confident of reaching the final at their home ground. Within 17 minutes Hamburg were 2-0 up but Laurie Cunningham scored for Real to retake the lead on aggregate. Hamburg threw caution to the wind and played all-out attack and their boldness was rewarded as two additional goals put them 4-1 up on the night and it was not until the final minute of the match where they could truly celebrate as Caspar Memering scored a fifth. Holders Nottingham Forest narrowly beat Ajax in the other semi-final and so the 25th European Cup final would be contested by the holders and Kevin Keegan’s Hamburg. At the Bernabeu the German champions had more of the possession but they could not find a way past England’s No 1 Peter Shilton. Forest’s flying left winger John Robertson scored the only goal of the game as Forest repeated Liverpool’s feat in successfully retaining their European crown. The fairytale ended for Nottingham Forest as the holders were eliminated by CSKA Sofia in the first round. Liverpool were enduring a poor domestic season by their own standards, finishing fifth, but the Reds cruised past Forest’s conquerors 6-1 on aggregate. The semi-finals was a match up of the European heavyweights as all of the teams had won the European Cup at least twice—Liverpool faced Bayern Munich and Real Madrid were up against Internazionale. At Anfield both sides cancelled each other out in a 0-0 draw. In Germany Kennedy gave Liverpool the lead with less than 10 minutes to play meaning Munich needed two goals to advance. Karl-Heinz Rummenigge scored for Bayern but Liverpool would hold on to reach Paris on the away goal rule. Real were laying in wait after narrowly edging out Inter 2-1 to reach their first European Cup final in 15 years. The final was very tactical and devoid of much excitement. Eventually Graeme Souness wrestled control of the midfield and Alan Kennedy received the ball from a throw-in, drove into Real’s penalty area and scored from an acute angle with the solitary goal enough for Liverpool to win their third European Cup in five years. Liverpool’s win means Bob Paisley is still the only coach to have won the European Cup on three occasions. 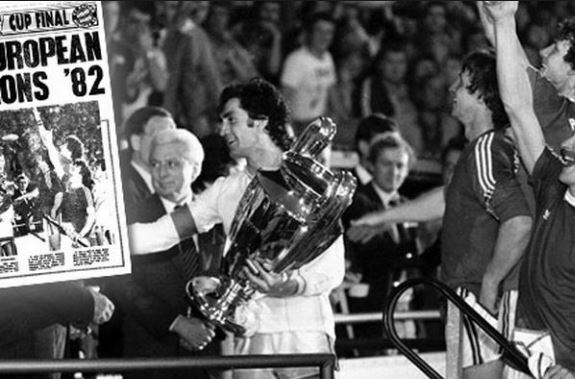 Aston Villa were the latest English champions to have a crack at the European Cup. The draw for the quarter-final stage was East versus West. Villa and Liverpool were paired with Dynamo Kiev and CSKA Sofia respectively and for the second season running CSKA knocked out the reigning European champions—they beat Liverpool 2-1 on aggregate after extra time in Bulgaria. A 2-0 win at Villa Park enabled the Midlanders to advance to the semi-finals. There they faced Belgians Anderlecht where one goal in 180 minutes of football was sufficient to make the final. Bayern Munich had scored seven in their semi-final and given their pedigree, with roster of experienced internationals, were heavy favourites to win the final held in Rotterdam. Villa’s domestic form had been poor and they had a change of manager during the season. Their slim chances of success took a knock when experienced goalkeeper Jimmy Rimmer was forced to leave the field through the recurrence of a neck injury. Young stand-in goalkeeper Nigel Spink entered the field and was in inspired form as he kept a clean sheet. At the other end Pete Withe scored a header to ensure England retained the European Cup for a record sixth consecutive season. Italy had won the 1982 World Cup and so Italian champions Juventus, a side that contained Golden Boot winner Paolo Rossi and key members of the Azzurri’s defence, were considered as one of the favourites to break England’s stranglehold on the European Cup. In addition to their local talent, the billions of lira at the disposal of the Agnelli family meant that they had also recruited French superstar Michel Platini. As per the previous season, Aston Villa and Liverpool were England’s representatives and both journeys ended at the quarter-final stage. Villa were comprehensively beaten by Juve as Rossi and Marco Tardelli scored the goals in Turin which knocked out the holders. Meanwhile, Liverpool were made to rue a poor first-leg showing in Poland against Widzew Łódź as a 2-0 defeat proved insurmountable. Juventus met the Poles in the semi-final and had the advantage of a home first-leg where a routine victory meant a draw or even a narrow defeat would suffice for the Bianconeri to advance to their second European Cup final. On the other side of the draw Hamburg secured their second final in the space of four years in what was a truly golden era for the Bundesliga club. In addition to winning the Cup Winners’ Cup and reaching a UEFA Cup final, Hamburg had won the German title three times in five years and were undefeated for a period of almost 12 months—a Bundesliga record which stood for over 30 years. 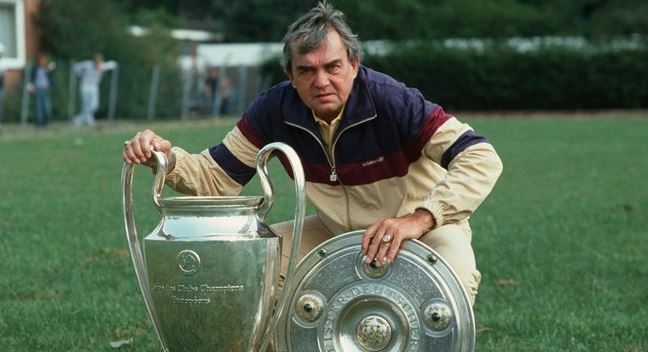 The mastermind behind the Germans’ success was coach Ernst Happel—a manager with huge pedigree. The Austrian had guided the Netherlands to the 1978 World Cup final after he had won the European Cup with Feyenoord and now again he was back in the final with another club. Hamburg had a tougher draw than Juve as they encountered Dynamo Kiev and Real Sociedad in the later knockout rounds. By successfully negotiating both ties, the Germans booked their place in the Athens final and setup a repeat of the recent World Cup final between West Germany and Italy—with the Germans hoping the Greek Gods would smile on them. Felix Magath scored the only goal of the game early on as he sent a long-range shot past Juve goalkeeper Dino Zoff. This was a an ominous sign for the Italians as the preceding five finals had all been won by 1-0 scorelines yet despite being favourites Juventus bewilderingly failed to rally and perform on the big occasion. Liverpool were back as they efficiently overcame all obstacles which included a 4-1 demolition in Lisbon of former Benfica in the quarter-finals. They were not the only Britons making noise however as Dundee United took the tournament by storm to advance to the semi-finals and meet Italian champions Roma. The first leg was held in Scotland and Dundee’s 2-0 victory left the Italians bitter, even accusing their counterparts of drug taking. 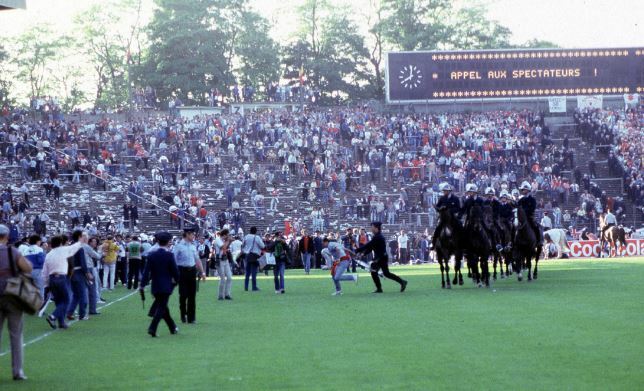 The second leg was a completely different affair as Dundee United’s players faced 69,000 hostile fans at the Stadio Olimpico. Roma started off strongly as a Roberto Pruzzo brace had levelled the tie by half-time. Agostino Di Bartolomei scored a penalty in the second half to secure their place in the final, to be played in Rome. Going into the final Liverpool faced a Roma team who had not conceded a single goal at home during the competition. Drawing on all their European experience Liverpool started the game positively and quietened the hostile crowd by taking the lead early on through Phil Neal. The goal stirred life into Roma and Pruzzo equalised before half-time. There were no further goals in the match, even after extra-time, so the 1984 European Cup final would be won via a penalty shoot-out. 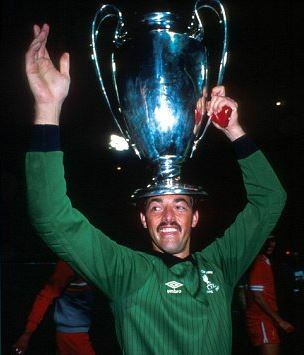 Liverpool’s goalkeeper Bruce Grobbelaar famously wobbled his legs as he took his place for Francesco Graziani’s penalty which resulted in a crucial miss and the Reds celebrated their fourth European Cup victory. However, Liverpool’s win was tarnished as the Reds fans were attacked by Roma supporters all over the Italian capital with reports of assaults and stabbings. Holders Liverpool and Italian champions Juventus were the favourites for the European Cup and both enjoyed a relatively straight-forward route to the final (Juventus almost threw away a 3-0 semi-final lead against Bordeaux) which was hosted at Heysel stadium in Brussels—the stadium’s fourth European Cup final. Tragically before kick-off, 39 Juventus fans were killed when a wall collapsed as they were running away from charging Liverpool supporters. Despite protests from both clubs the game went ahead after being delayed over an hour. A Platini penalty separated the sides. Even with hindsight UEFA claims that ordering the game to be played may have saved lives. This was a dark day for football where drunken violence on the terraces was at its absolute peak. UEFA then took the decision to ban English clubs indefinitely from European football.